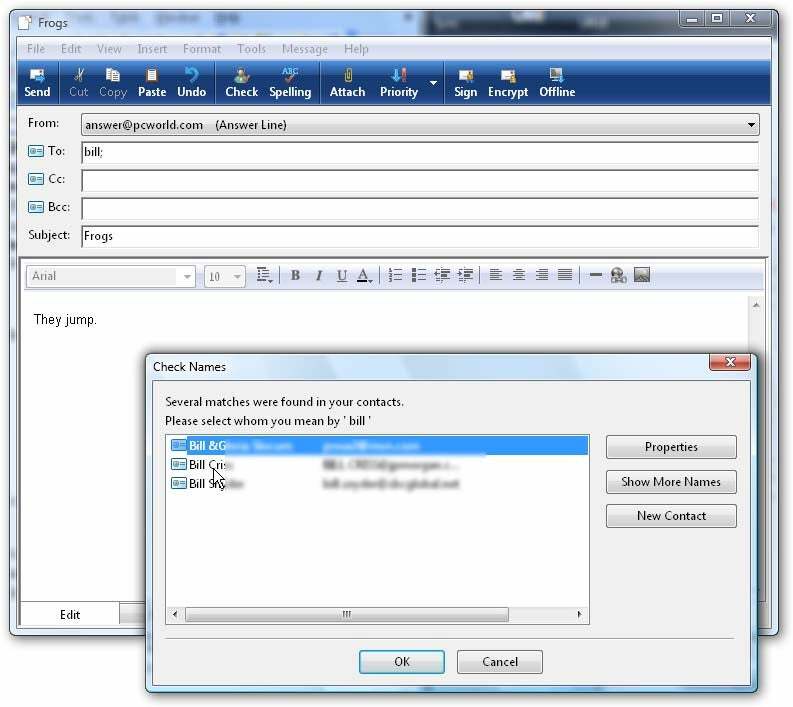 Why Doesn't Vista's Mail Program Help You Type in Contacts? Microsoft tried to make the simple task of addressing a message easier in Windows Mail. They succeeded in making it less intuitive. But once you know what's going on, addressing Windows Mail messages is as easy as addressing them in Outlook Express. In the good old days, when you started typing in the To box, Outlook Express would fill in the address for you. It probably wouldn't be the right address, but as you kept typing, it would eventually find the right one. But with Windows Mail, typing into the To field doesn't give you anything except the letters you type. No wonder some people think you have to go into the address book if you don't have the name or email address memorized. But you don't. Type in part of the name or address--it doesn't even have to be the beginning--then press TAB to move on to next field. If you typed a unique string of text--one that only appears in one contact's name or address--Windows Mail will insert the proper contact into the field. This is handy if you're writing to someone with a real weird name, like lincoln . bill, nothing happens when you leave the field. Very discouraging. But when you finish writing your message and click Send, Windows Mail brings up a list of all contacts with that string in the name or address. Double-clicking the right one will send the message on its merry way. You see, the problem isn't that Vista is more difficult, it's just that it doesn't give you an encouraging sign that it knows what it's doing. Unless you keep using it. Eventually Windows Mail figures out who you write to frequently. As you continue to use it, those names start to appear when you type them, just like all names did in Outlook Express. But now, there's a better chance that the first name that pops up is the right one.